The Nexus Dialogue on Water Infrastructure Solutions focuses on developing renewed attention on major infrastructure development for water, energy, food security and climate change resilience. Since 2013, IUCN and IWA have successfully organized a series of regional workshops in Africa, Latin America, Asia (with UNESCAP) and Central Asia (with EastWest Institute) on the role of infrastructure in the nexus. 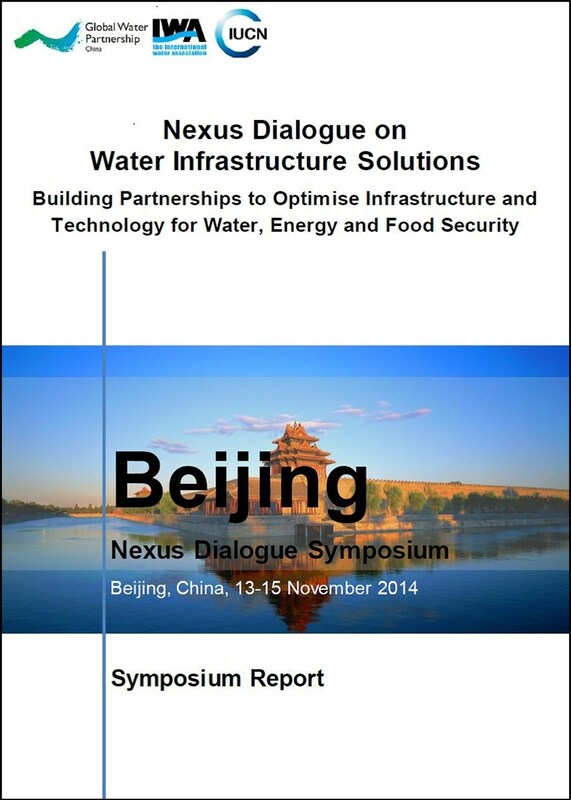 The most recent event was the Symposium on Infrastructure Solutions in the Water-Energy-Food Nexus in Beijing, China in November 2014 in partnership with GWP China. China is the most populous country in the world, with approximately 1.3 billion people (22% of the world population). In order to sustain the population and economy, there is a growing demand for water. 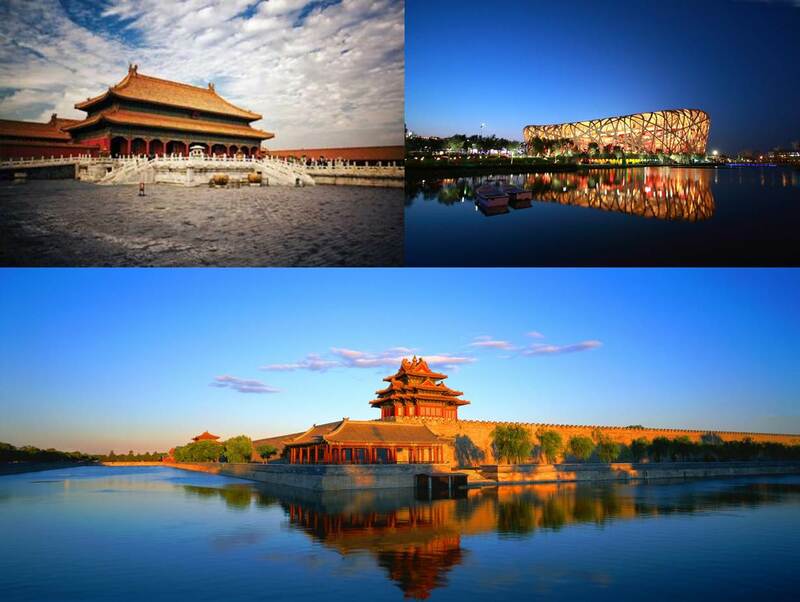 However, water scarcity is threating many cities and regions in China. About 400 of China’s 660 cities are reportedly short of water; of those, 108 cities, including megacities like Beijing and Tianjin, are facing serious water shortages. We invited more than 80 outstanding international and regional professionals, from both public and private sectors from previous Nexus Dialogue regional workshops, together with new faces. The Beijing Symposium provided the opportunity for participants to share experiences and learning with Chinese experts; discuss findings from the global nexus dialogue to date, and to feed into the development of concepts and ideas. The Symposium provided space for participants to work on a set of recommendations, which will establish policy principles for sustainable water infrastructure operation, management and optimization in the nexus. 2. Using the nexus to accelerate social development and support water stewardship and corporate engagement – This theme focused on social and economic development approaches, including corporate sector engagement in linking water, energy and food security and accelerating infrastructure development across scales. 3. Influencing pathways of investments for in the nexus - This theme examined money flows channelled into infrastructure and technology especially in emerging economies, and the factors influencing the pathway of these investments to resource water-energy-food nexus solutions. 4. Natural infrastructure/ecosystems in the nexus - This theme sought to promote better understandings of the importance of healthy ecosystems in well-functioning infrastructure built for irrigation, hydropower or municipal water supply, and in achieving the economic returns necessary to justify investments. 5. Power dynamics (policy and institutional change/collaboration) across the nexus - This theme gave special attentions to current and future policies for sustainable water infrastructure operation, management and optimization in the nexus, with the expectation of moving cross-sectoral discussions to implementation mode, focusing on improving the enabling environment to ensure that collaboration and joint solutions lead to shared benefits. An important outcome of the Symposium was discussion of five synthesis papers that mirrored those five themes. Synthesis papers highlighted sectoral and integrated best practices, and made insightful connections between the sectoral components of the nexus. In addition, key recommendations were further developed for each theme. Participants also contributed to the development of a framework to identify concrete nexus challenges and analyse examples of inter-sectoral collaboration, incentives for policy coherence, roles of actors and institutions and joint visioning & planning. The Nexus Dialogue on Water Infrastructure Solutions has provided a renewed focus on major infrastructure development for water, energy, food security and climate change resilience. 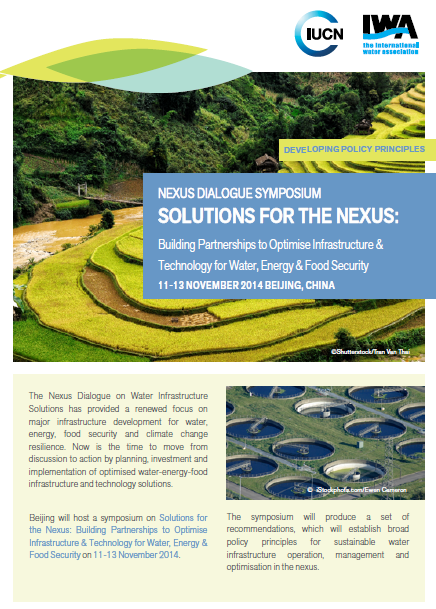 As a continuence of Nexus Dialogue, the Beijing Sympsium invited pro-eminent international and regional researchers, practitioners, technology developers, innovators, investors and government officials active in water, energy and food fields to together produce a set of recommendations, which would help establish policy principles for sustainable water infrastructure operation, management and optimization in the nexus. 1. The nexus and resource scarcity/security in the Amazon – Helen Bellfield, Global Canopy Programme, Oxford, U.K.
Day 2, Friday 14 November 2014, What Works in the Water-Energy-Food Nexus?